A few months ago, I decided to test moving weekly Wolverine news and reviews to the Wolverine Files Facebook page (also displayed as a module on the right side of this page). The upside for me was twofold. 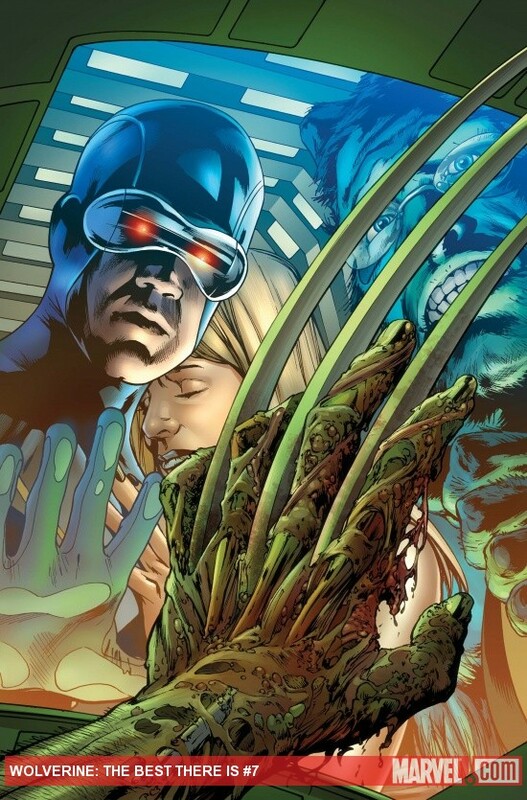 One, to expose Wolverine Files to a new audience on Facebook, something that has worked phenomenally well as we have over 5,700 Facebook fans to date. And two, to make it quicker for me to post Wolverine reviews and news (it takes me about a minute per post now versus the 15 minutes it took me on the website). The downside, of course, is that while traffic is up on the website, the weekly posts on the website have dwindled to a few per month. Unfortunately between work and several writing projects I am working on, I have come to the realization that in the coming months, this situation is only going to get worse. So I need to announce that moving forward, ALL Wolverine news and reviews are moving to Facebook and that I will be making a concerted effort to complete the Wolverine Files chronology up through the end of the original Byrne-Claremont run. This will result also in a change to Wolverine Files homepage in the near future to focus entirely on the chronology itself. The good news is that you can ‘Like‘ Wolverine Files in the Facebook module on the right and see those updates automatically on your daily Facebook news feed. The bad news is that some of you don’t use Facebook, and for that I apologize. But if I am going to make a legitimate run at getting published, something had to give. So let me take this opportunity to thank the many of you who have been here from the start and invite you to be as active as you have in the past on Facebook. On sale June 27, 2011. This was definitely better than previous issues, but that’s not really saying much. It’s frankly too much of a caricature of the Wolverine and the X-Men, with an overly glib script and an absolutely ridiculous new look for Logan. And if the Facebook comments are any gauge, I’m not the only one who doesn’t care for this series. On sale June 22, 2011. This is a stellar issue. Everything that didn’t work last issue, worked this issue. The flashback story is heartfelt and touching, striking a perfect balance between revenge and remorse. 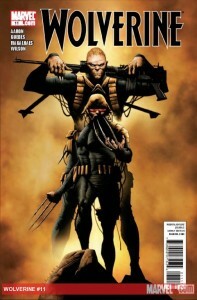 And the last page provides a link from the past to the present storyline started back in Wolverine (2010) #1. 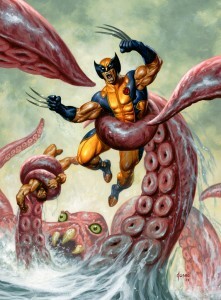 Jason Aaron, I tip my cap to you. On sale June 8, 2011. I think the world of Jason Aaron. 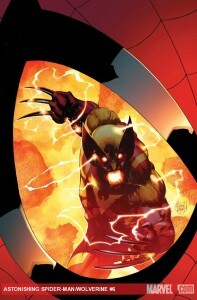 In my opinion, he’s one of the best Wolverine writers, if not the best, in a long time. 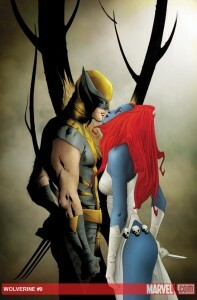 Unfortunately, the story and pacing of “Wolverine’s Revenge, Part 1” just do not work for me. 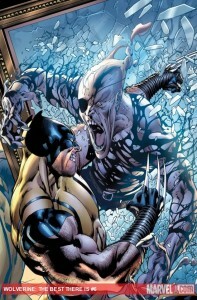 We start with Wolverine’s bloody battle with a seriously D-list villain (Cannonfoot?!? ), interspersed rather inelegantly with 12 pages of humdrum flashbacks. And the final page is so weak, one wonders if the printers forgot to print Aaron’s traditionally jaw-dropping cliffhanger. Perhaps that’s what we get when Marvel cranks this series up to two issues in a single month. On sale June 1, 2011. 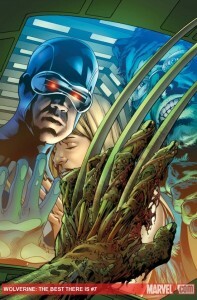 To my mind, this series is the epitome of what is wrong with comics today. It simply did not need to exist. The comics universe would have been the richer for it not having been published. What little money was spent on it could have supported a much worthier title fighting for survival in such an oversaturated environment. I mean, the writing was dreadful, and as far as I can tell, the theme of this series revolved around decidedly unfunny references to bad movies. And, the kicker is that the story retconned in on itself such that its non-existence would have gone unnoticed. On sale May 25, 2011. “Get Mystique, Final Repose” picks up where last issue left off and aside from a slightly ridiculous new villain and a cheesy new communicator belt, Aaron and Acuna deliver the goods. But seeing as how I’m a proud former owner of a 1968 British Racing Green Mustang, the second totaling of Wolverine’s Pony is especially painful. This finale is not at all what I was expecting. It is not full of “Sturm und Drang”. 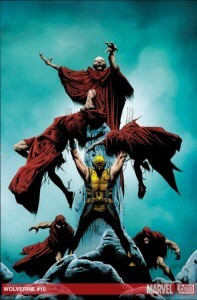 It is rather poignant, personal and provides a final unexpected twist that promises a very big confrontation for Wolverine in the future. What did the rest of you think of it? The update for 012: Team X is now live, including several highlights of the chronological contradictions brought on by the stories of Larry Hama and Daniel Way.